Small wheel loaders continue to dig out a bigger niche in the North American machine market. These smallish, tool-carrying, articulating or all-wheel-steer loaders are becoming popular enough that we added compact wheel loaders to our annual Spec Guide in 2017, and we highlighted 13 major manufacturers including Case, Cat, Gehl, Hitachi, John Deere, Kubota, Mustang, New Holland, SDLG, Takeuchi, Volvo, Wacker Neuson and Yanmar. Here are a some of the latest models from some of those manufacturers. 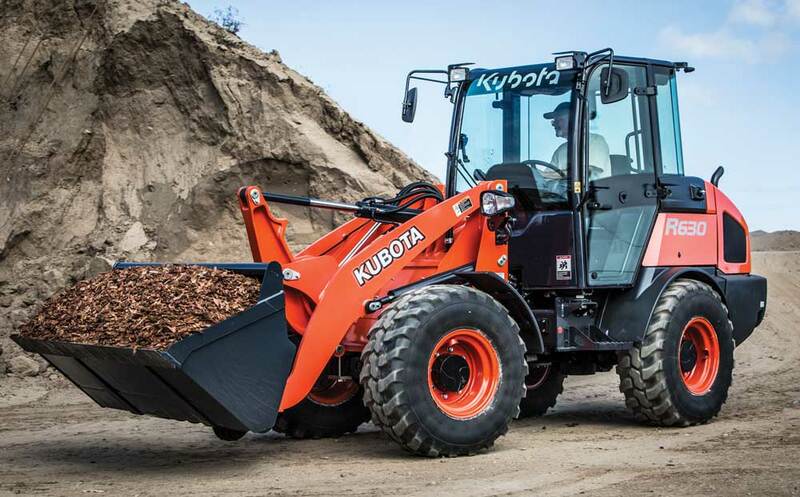 Kubota’s R530 and R630 wheel loaders offer visibility, big power and high productivity in a compact loader. Standard four-wheel drive, 100 percent on-demand differential lock and rear frame oscillation provide traction, ride and stability on both Kubota R Series models. The R630 features four operating modes that can be easily selected to match the machine’s application. The optional heated and air-conditioned enclosed cab for the R530 and R630 ensure year-round comfort with features like an adjustable suspension seat and excellent visibility for long hours on the job. The joystick-mounted forward and reverse switch allows for convenient, on-the-go direction changes without clutching or braking. An optional quick-coupler makes for fast, safe and easy bucket and attachment changes; the quick-coupler is available in both a skid loader style and Euro style coupler to best fit the owner’s needs. For more info, visit kubotausa.com. The Case 321F compact wheel loader is designed for improved maneuverability, versatility and performance. The F Series compact wheel loaders feature Case’s proven maintenance-free Tier 4 Final particulate matter catalyst solution and offer a more compact design while simultaneously increasing breakout force and lift capacity compared to previous models. The 321F is rated at 74 hp. Ideal for work in general construction, landscaping and supply yards, compact wheel loaders pick up where skid steers leave off in lift capacity, ground clearance, cab height/visibility and application versatility. The 321F features increased attachment compatibility, exclusive new electronic controls and added cab comfort features to improve machine performance and reduce operator fatigue. For more info, visit casece.com. Takeuchi-US’s TW65 Series 2 compact wheel loader, equipped with an EPA Tier 4 Final engine, delivers strong performance, serviceability and a deluxe operator’s cabin in the compact wheel loader category. The compact design allows these loaders to easily maneuver in tight spaces with minimal damage to lawns, pavement and other sensitive surface areas. 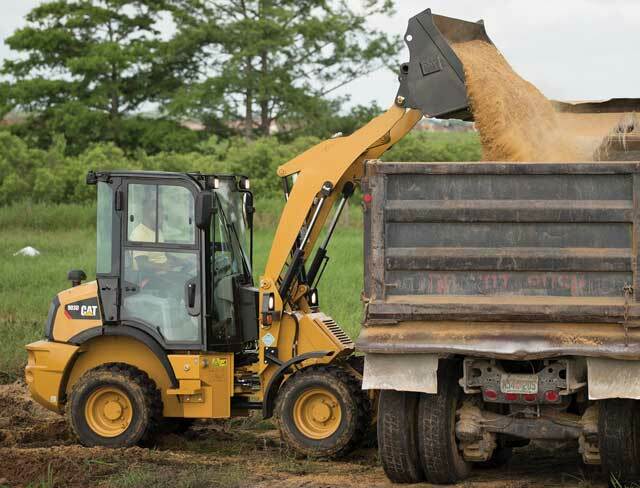 The compact wheel loader provides reach and dump heights up to 8 ft, 1 in. for trouble-free material handling. With an operating weight of 11,354 lbs, the compact wheel loader offers a rated operating capacity of 4,050 lbs and a bucket breakout force of 11,600 lbs. 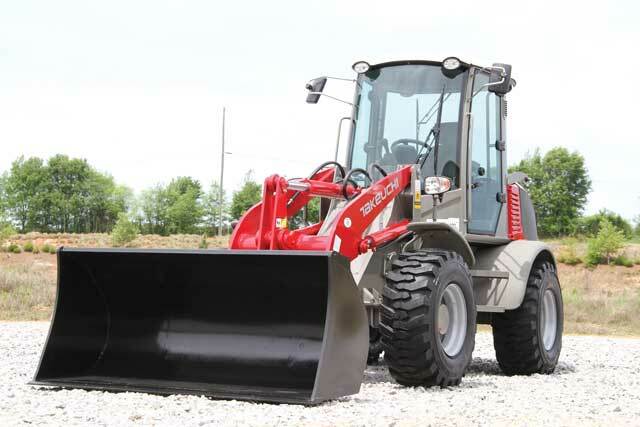 Delivering power and precise control, the loader is equipped with a turbocharged, water-cooled 73-hp Deutz engine. For more info, visit takeuchi-us.com. 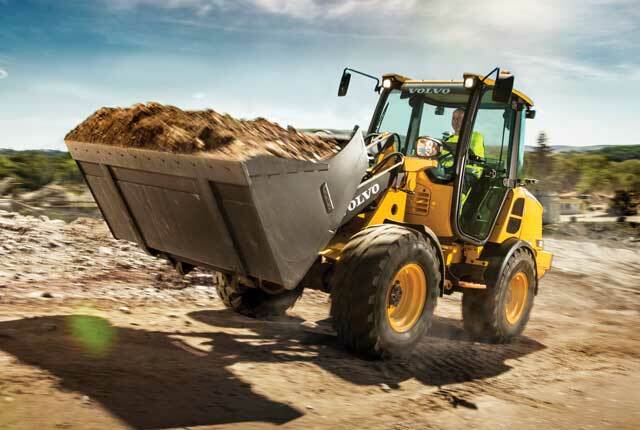 Combining speed, precision and lift capacity, the new John Deere 344L compact wheel loader provides peak productivity. The 344L offers a faster travel speed with smooth auto shift technology up to 25 mph, ideal for customers who have larger jobsites to traverse or do snow removal. The industry-exclusive Articulation Plus steering system on the 344L allows operators to lift more during turns than leading competitive machines, says John Deere. Its design features an articulated frame plus rear-wheel steer, providing a tighter turning radius, improved stability and additional lift capacity. In addition, the newly designed loader arms and coupler provide better parallel lifting of attachments and increased visibility, especially for operators using forks. With a full-turn tip load of 12,650 lbs, customers are able to lift heavier loads and can keep more material in the bucket without adjustments. For more info, visit deere.com. Wacker Neuson’s all-wheel steer loader, the 8115L, offers the power and capacity for larger jobs but has a compact design to access hard-to-reach areas. 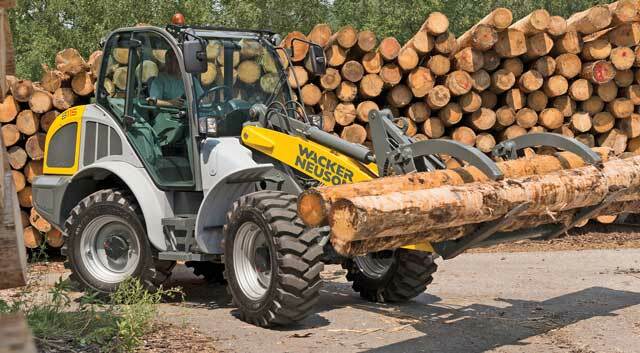 Wacker Neuson offers one of the broadest selections of all-wheel steer (AWS) compact wheel loaders in North America. 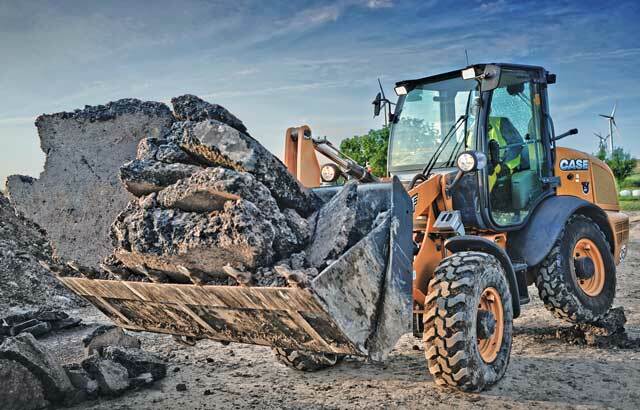 A unique feature of the AWS wheel loader includes a rigid one-piece chassis that prevents shifts in the center of gravity even at full turn. This ensures stability, even when working on uneven ground, and maintains a constant payload. The AWS has a 40-degree steering angle on each axle that allows the high degree of maneuverability which helps to reduce transit and cycle times. The new 8115L is powered by a 100-hp Deutz turbo diesel engine that delivers maximum power to the lift arms, drive system and attachment. For more info, visit wackerneuson.us. Volvo’s L20H and L25H compact wheel loaders offer great maneuverability and are versatile machines for many applications. For example, their low profile is optimal for loading and unloading containers, and their low center of gravity gives added stability for carrying heavy loads on rough terrain. The H-Series compact wheel loaders are operator-focused machines offering a joystick lever controlling three functions, including the hydraulic attachments, multi-purpose buckets, sweepers and augers. Safety and efficiency are improved by all-around visibility, minimal noise and vibration and an adjustable steering column. The L20H and L25H are powered by a Volvo D2.6M Tier 4 Final water-cooled engine with a diesel oxidation catalyst that eliminates the need for regeneration or additives. The fully automatic hydrostatic drive has two speed settings and the ability to reach 18.6 mph. For more info, visit volvoce.com. The new Cat 903D compact wheel loader, compared with its 903C2 predecessor, features a 25 percent increase in both lifting capacity and travel speed, so customers are able to do more, faster. With new optional features, such as creep control, throttle lock and work tool electrical harness, the 903D has the ability to run any number of tools. Available with either an open or enclosed cab, the 903D operator’s station features an ergonomic design with a new multi-function joystick that provides fingertip control of the standard third-function hydraulic system. 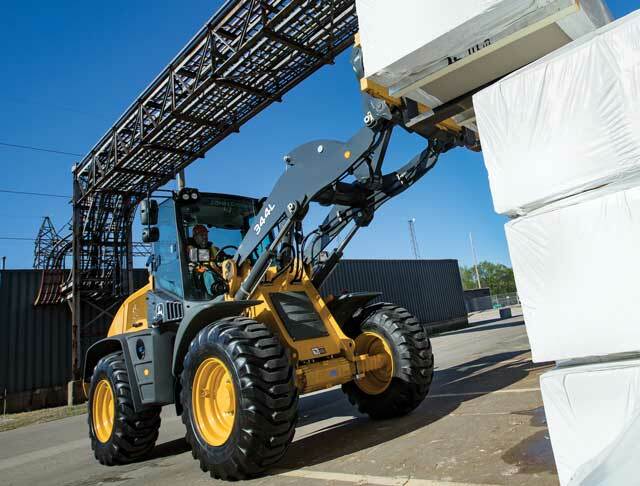 Whether lifting light material into a hopper or pallets onto a truck, the choice of standard-lift or high-lift boom arms increases the 903D’s ability to work efficiently in a wide range of applications with buckets ranging in capacity from 0.8 to 1.3 cu yds, forks or a selection of powered and non-powered work tools. For more info, visit cat.com. We have loads more wheel loaders here.